HOUSTON COUNTY – Everyone knows why the chicken crossed the road. It was to get to the other side. However, no one has ever mentioned what might happen when nearly 40 tons of poultry crosses the aforementioned road. 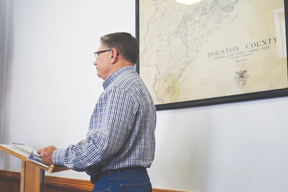 That very problem was presented to the Houston County Commissioners Court during a meeting held on Tuesday, Feb. 28. 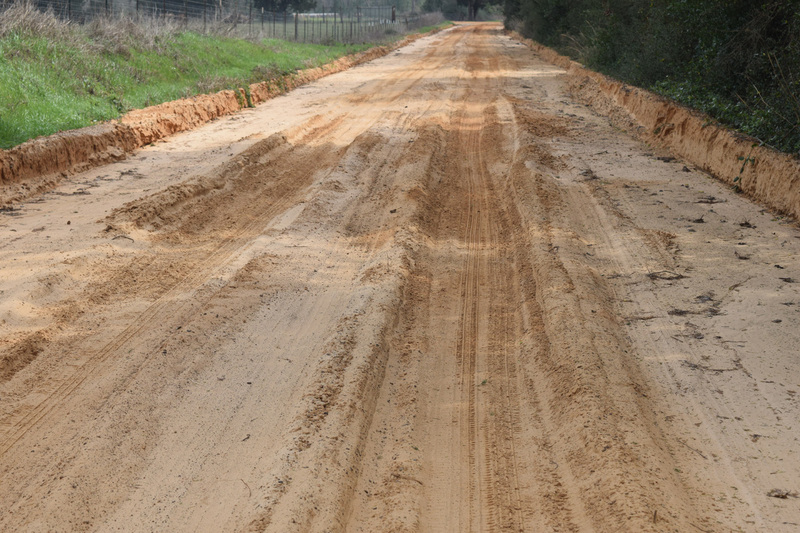 An item on the court’s agenda stated the commissioners would hear a report from residents on road conditions caused by Sanderson Farms’ trucks on County Road 1885 in Precinct One. When the court reached this agenda item, CR 1885 resident Garry Holcomb addressed the commissioners. CR 1885 is located approximately one mile north of the city limits of Grapeland. Holcomb explained to the court he and other residents along CR 1885 had attempted to work out their differences with Sanderson Farms but had met with no success. “We met with Randall Boehme and Ashley Fontenot, who are employed by Sanderson Farms. We talked with them and tried to find some common ground. We had no luck at all. Towards the end of our meeting, a question was asked about if the road should be maintained to the same condition as it was in when Sanderson Farms came here and built these chicken houses. Very quickly, they responded no,” Holcomb said. Boehme and Fontenot are executives within the corporate hierarchy of Sanderson Farms. “If you can’t agree the road should be maintained to the same degree it was before they moved there, it tells me they have no intentions of maintaining the road. They have no respect for the property of others,” Holcomb said. He said he and his wife had built their home on CR 1885 30 years ago, and with the exception of the last two years – since the arrival of Sanderson Farms in Houston County – they have had no issues. “The roads were in good shape before they came but they have steadily deteriorated and I will say now they are pretty much destroyed,” he said. As Holcomb continued, he referred specifically to the day of Feb. 14. He explained that was the day the chickens were harvested and were being transported down CR 1885. Holcomb said it also started to rain that day and as a result, the road was so badly damaged, he was barely able to go to work. Photographs of the ruts created on the road were distributed to the commissioners as they listened to Holcomb. “I thought this was bad at the time I took these pictures but since the rain two weeks ago, it has gotten even worse. It is so bad, one of the Sanderson Farms’ 18-wheelers got stuck and they had to have a wrecker to pull it out,” he said. “Sanderson Farms does not take the position the road should be maintained in the same condition it was in when they got there,” Holcomb said. Holcomb also discussed how Sanderson Farms had destroyed a tree when one of their drivers got too close and wound up with a cedar tree in the bird cage area. “They had the road blocked for several hours. People couldn’t get through. I got out there and I was there for an hour and a half. I talked with Randall (Boehme) that night and I told him I spend almost twice as much time on this road as I do any other road. I encouraged him to buy some rock and rock this road. If you buy the rock, we’ll be glad to spread it,” Precinct One Commissioner Gary Lovell said. “We spend more time on that road than any of the other 68 roads I have in my precinct. I have done everything I can do to encourage Sanderson Farms to provide us with some rock,” Lovell said. The commissioner said the county roads were permitted for 54,000 pounds and yet according to Boehme’s conversation with Holcomb, the Sanderson Farms’ trucks were carrying nearly 80,000 pounds of cargo. Precinct Four Commissioner Kennon Kellum suggested the county consult with its attorney and see how other counties in the same position as Houston County are dealing with road damage caused by Sanderson Farms. “To summarize, they’re tearing the roads up, they’re tearing the trees up, they have no respect for other people’s property and they can’t even agree to maintain the road in the same condition it was in when they came there. They have no respect for others,” Holcomb said.